Spin classes are great for unwinding at the end of a day. 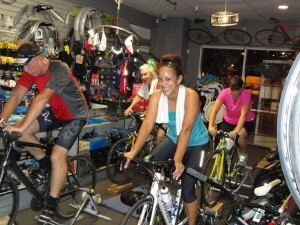 Spinning with other people encourages one another and releases the days tensions and also calories. Heart health is the obvious benefit and lets you work on your breathing as well. A spin class can burn on an average of 500 calories. You do not have to follow all the techniques your instructor teaches, go at your own pace. Make it comfortable for yourself, enjoy the music and spin your day away.